BOOK TREASURE: The retelling sheets are due tomorrow. MATH TEST: We will be testing on Unit 3 in math on Thursday. Watch for review sheets to come home the next two days, one will come home for homework. Your child can work on it to prepare for the test and it does not have to be returned to school. LIBRARY: Since there is no school on Friday, please have your child bring back their library books on Thursday. We will be going there to check out books on Thursday this week. FLUENCY SHEETS: The one-minute fluency sheet needs to be returned to school on Thursday this week. Please make sure that your child completes the questions on the back side!! NO SCHOOL: There will be no school on Friday due to Record’s Day. Yesterday we got to see the Basketball Jones Assembly. This was our second year with Basketball Jones. It is a wonderful character building assembly. Iman, Chase, Peter, and myself were all lucky enough to get to go up and help!! NAKED TURKEYS were due today. I told the kids they could still turn them in tomorrow. If they don’t have them tomorrow, they will be considered a missing assignment. BOOK TREASURE retelling sheets are due tomorrow. NOVEMBER BOOK ORDER forms are due tomorrow. FIRST TRIMESTER MATH TEST: We will be taking our first trimester math test next Monday. The two skills that will be tested are adding/subtracting within 20 and telling time to 5 minute intervals. The math grades on the report card will be based on this test, so it is very important that your child is secure in these skills. Your child will be bringing home a review packet tomorrow. This will help prepare them for the test. It does not need to be returned to school. This week we are working on Unit 10 in Spelling. Your child should have brought home their pretest and homework sheet today. This week’s skill is proofreading (finding words that are misspelled.) Homework is due back to school by Friday. If you would like to practice this week’s skill, just click on the picture below. It’s a fun proofreading game that will have you proofreading for capitalization, punctuation, and spelling. Once at the site, just click on grade 2. Have fun!!!!! We have been learning about place value in math. Here are a few games to practice place value. Just click on the picture to get to the games. Have fun!! This week, our iPad project was a verb poster. We created our posters in an app called Pic Collage. The kids had to think of 3 verbs. Then they had to find pictures to represent their verbs. Once they inserted their pictures they labeled them. If you would like to take a look at our slide show, just click on the picture below to go to our classroom weebly. 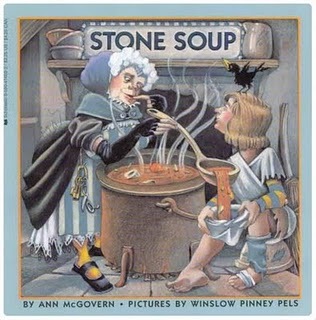 This week for our Book Treasure book we read Stone Soup, written by Ann McGovern. Yesterday, your child should have brought home their envelope, retelling sheet and a stone to keep in their treasure chest. Please make sure that your child returns their retelling sheet and their envelope by next Tuesday. If you would like to listen to the story again, just click on the title below. This week we had our first Fish Celebration. We went into the gym with the other second grade classes and the first grade classes. We recognized students who are following the fish philosophy. In our class, Noor, Rihanna, Andrew, and Blake were recognized for their positive efforts in the areas of play, choose your attitude, be there, and make someone’s day. Congratulations and keep up the great work!!! !